Virtually every woman who’s ever tried online dating in the past decade has encountered the dangerously fragile male ego. Online dating isn’t what it used to be back when it first began and was email-based. Back then, people answered questions and wrote letters. Today, it’s all about mobile apps and messaging. And the men are decidedly more fragile and entitled. It doesn’t matter which app you use–Tinder, OkCupid, Bumble, FetLife and more all host their own mix of men who feel so entitled to a woman–any woman–that they are not ashamed to curse out a female who tells them she’s not interested. Illustrated. 397 pp. Soft Skull Press. Paper, $16.95. This remark from the narrator of Lynne Tillman’s intricate new novel, “Men and Apparitions,” exemplifies the book’s swirl of humor and horror, evasion and candor. Ezekiel, or Zeke, Stark is a cultural anthropologist in his late 30s, obsessed with images, both the concrete kind (photographs) and the metaphorical kind (“self-image”), a “privileged, educated” screw-up, as he says of himself, steeped in theorists like Clifford Geertz and Walter Benjamin, but also in pop culture — Pee-wee Herman, Steve Jobs, JonBenet Ramsey, etc. — that pantheon of people all of us know but none of us has met. In other words, Zeke is an American consumer, though what he consumes is not material goods but media, endlessly cataloging and referencing the contents of his own mind, often in lieu of visceral experience. The New Man, Zeke calls this type — his type — and Tillman’s novel is a patient, insistent exploration of what it means to live inside such a mind. Sit with a straight female friend as she browses Tinder, and you’ll start to see some patterns very quickly. Group pics where you can’t tell which guy the profile belongs to? Check. Poorly lit, glowering selfies? Triple check. To solve a problem, we must first understand its cause. So, why are men bad at taking selfies? I’ve got one simple explanation: Men don’t grow up in a culture that forces them to objectify themselves. Person 1: Did you have a good weekend? 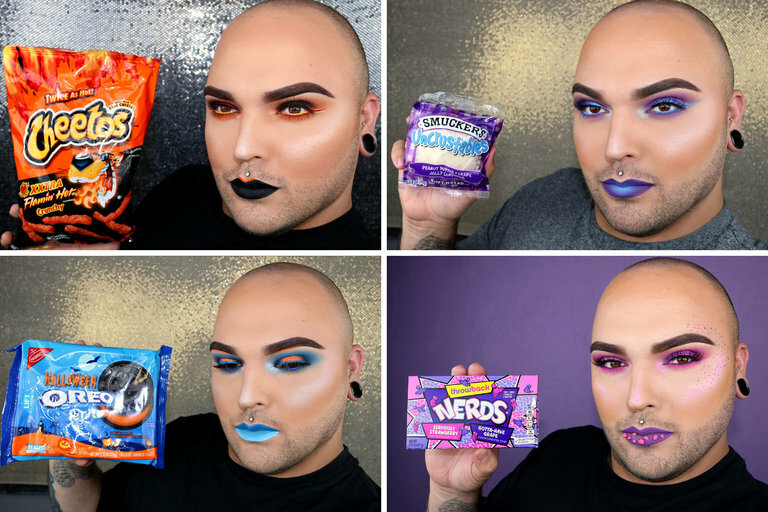 My favorite person on Instagram these days is a guy who matches his makeup to his snacks. …Watching Skelotim at work is mesmerizing. He slickly sets his makeup routine to pounding pop music, transforming from a regular dude into a sparkling vision of the fabulously strange. It’s just like Cinderella twirling around and around until she finds herself wearing a poufy blue ball gown, except Skelotim is changing into a Flamin’ Hot Cheeto. In the age of the selfie, what more appropriate canvas is there for an internet artist than his own face? Skelotim is one of a handful of young men who have primped and preened their way into the female-centric world of Instagram and YouTube makeup artistry.